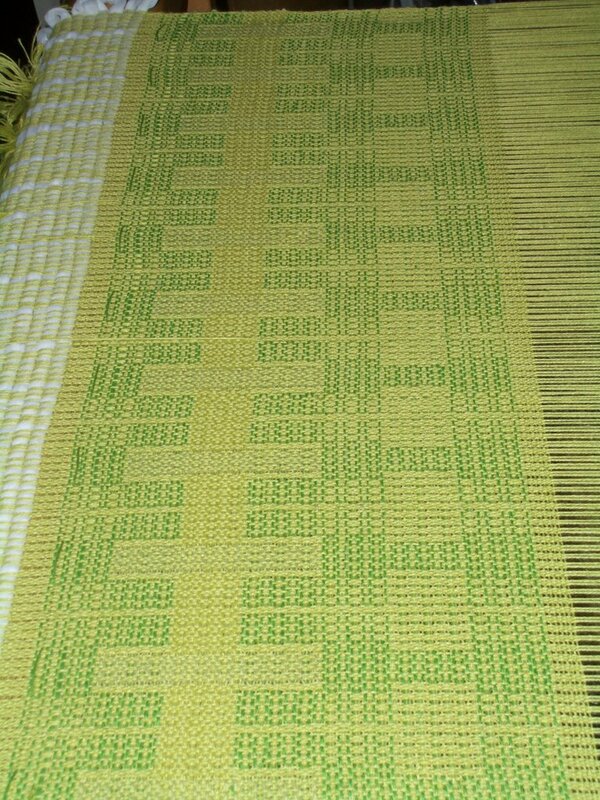 Here is the result of the shake down process for my 'ribbon' dish towel yardage. Its good I did the shake down...at least five threads needed 'fixing' and one pedal was tied on incorrectly. I must say that it does indeed look like dish towel yardage. I don't quite see the ribbons going in and out of each other in the pattern, but I had the tabby and the medium pattern weft be the same value which is not exactly correct. But I didn't have enough of the right sized bobbins at the time. I do now. Another issue is that I am using the same size yarn for the pattern, tabby and warp. 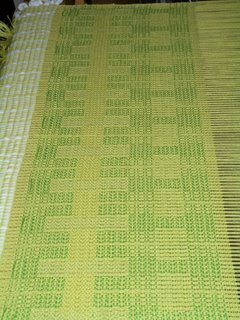 Apparently on summer and winter the pattern threads are traditionally two times the diameter of the tabby and warp so they slide nicely into place. I don't mind the look and feel of what is coming out. My reference, says that if you want a balanced weave it normally takes two repeats of a given pattern part...my weave is not balanced at two times...nor is my taquete for that matter... I think I would need a wider sett than 24 epi but I like how it feels at this sett. I'll need to finish a towel - who knows how it will look after washing and finishing. Have you read that challenging the mind helps keep Alzheimer's away? For example, they recommend doing cross word puzzles or that card game Concentration. Well, another thing to add to the list is to weave this summer and winter pattern - not only does the mind have to stay in concentration mode but the entire body gets a workout as I throw three shuttles back and forth and push down pedals with a span of about a yard. I find this much more difficult than taquete on a table loom. It will be a slow weaving process. Although it should speed up once I get the hang of it. Next I will switch to my desired palette of yarn colors and see how it comes out. Gorgeous dishtowel fabric - love the color too. I hope there will be one at OUR gift exchange party and that I get it!!! Great looking bookmarks! I'll be sure to keep mine out of library books so I won't inadvertently lose it.